I was doing my daily blog reading this morning, and I stopped by one of my favorites, Florida Cracker Crumbs, and found I had been awarded the "I Love Your Blog" prize by that blog's lovely owner. Thank you!! I love your blog, too, especially the Monday Mystery photos. Some Cranky Guy who makes me laugh so hard sometimes I spit on my monitor. From A Heavenly Land whose daily devotional writings gleaned from her own life are an inspiration to me. Here is the award - just right click on it, save the picture to your computer and post it on your blog. To be polite, you should pass it on. You are very kind. I am glad that God blesses you through the words and images He gives me. 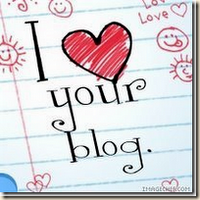 And a great big thank you for teaching me how to save it to my blog! LOL I am so illiterate when it comes to these kinds of things! And yes, I can't agree more: it's amazing what a good network of "bloggers" we have here in Florida. Florida is a great state: after 10 years it really has the feel of "home" ... I'm glad Ponce De Leon discovered it.